Most of us rolled our eyes when our mothers told us to go to bed early before a big test at school because we "needed a good night's sleep"--but was there actually something to that constant maternal nagging? The vast majority of us experience the effects of sleep deprivation far too often, sometimes even without us knowing it. How has sleep deprivation affected you? Share your story and thoughts with us and our visitors. As it turns out, the drive to sleep is biologically regulated by an internal process called sleep homeostasis. In simplest terms, this means that additional sleep obtained will decrease the desire to fall asleep and lost sleep will increase the desire. That's intuitive enough, right? But what does this mean for us as we go about our lives everyday? Let's dig a little deeper. Although the amount of sleep an individual needs varies from person to person (age also has a strong influence), adults generally need around 7 to 9 hours of sleep each night, and younger individuals need significantly more. When you don't get enough sleep one night, you accumulate what's known as a sleep debt. If the trend of not achieving your daily sleep requirement continues, your sleep debt continues to increase accordingly, further adding to the burden you must carry around with you, and degrading your performance, throughout the day. We can think of sleep debt like a growing weight over us that we have to carry around throughout the day. Unless paid back, the debt gets bigger and bigger while we're awake until...SQUASH!!! We're asleep! In order to feel fully rested again, and to achieve optimal alertness throughout the day, there is but one long-term solution that never fails: you must repay your sleep debt hour for hour. To reemphasize what was mentioned above, your sleep debt will continue to accumulate over days, weeks, and months without diminishing, unless you do something about it, so this is sometimes easier said than done, but the importance of doing so is paramount. How do you do something about it? The only answer is to pay it back by getting more sleep, and then consistently get more sleep until the debt is more or less entirely paid back. Far and away the most important aspect of the homeostatic regulation of sleep is the following simple fact: sleep loss is cumulative. When total nightly sleep is reduced by exactly the same amount each night for several consecutive nights, the tendency to fall asleep in the daytime becomes progressively stronger each day, and performance is often compromised as a result. Why Should You Care About Sleep Debt? 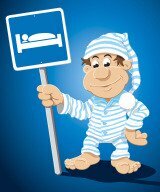 Sleepiness is your biological tendency to go to sleep at any given moment. Since your body governs how tired you feel, you cannot simply "muscle through" your feelings of fatigue all the time. Eventually they will catch up, and you will be forced to repay a part of your sleep debt. But in the meantime, while you carry a large sleep debt, your performance throughout the day will be impaired in many facets, whether you realize it or not. One of the easiest to feel effects of sleep deprivation is a decreased ability to atay attentive. How often throughout the day do you feel like this? Carrying a sizable sleep debt throughout the day can drastically decrease productivity. Fatigue will compromise your attention, and as a result cognitive performance will suffer. Specifically, learning, memory, and creativity are frequently hampered by a large sleep debt. In a situation such as driving a car this decreased alertness can, and has repeatedly, led to fatal results. It's not uncommon for sleep-deprived individuals to be subject to extreme emotions and mood swings. A very tired person who is laughing uncontrollably at one moment may be crying or yelling angrily a few minutes later. A lack of sleep is often associated with a hindrance of bodily control. Tired individuals often feel enhanced physical impulses, such as an otherwise inexplicable desire to eat. Extreme sleep deprivation can literally cause a degree of physical pain, such as headaches. In early 2009, a couple of Sleep and Dreams students made a hilarious parody of the popular TV show The Office that demonstrates many of the above negative effects of sleep deprivation. Watch the clip below to see how Michael Scott, a regional manager of Dunder Mifflin, decides he is going to avoid these effects from compromising the productivity of his workers. On a sobering note, the dangerous results of carrying around a large sleep debt are absolutely, undeniably real. As Michael Scott humorously points out in the clip, the consequences are not just productivity related. Having a sleep debt increases the tendency to fall asleep, and when this happens in situations like driving a car the results are often downright tragic. The ultimate cost of sleep deprivation is a driver falling asleep at the wheel. 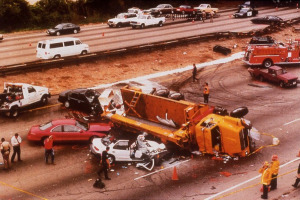 Eighty percent of these types of accidents end up fatal, and they happen far too often. Official statistics show that drowsy driving results in over 100,000 automobile wrecks every single year--and those are quite evidently conservative numbers, for fatigue often plays a major role in many accidents where it is not officially documented. Drowsiness can become sleep at any moment, and once it happens there is no further warning. In sleep you are completely blind and completely powerless, and this my friends is way worse than drunk driving, where at least an impaired version of your senses can guide you along (that is by no means a justification of drunk driving, of course). Too many people are tempted to think that they know exactly when they are in danger of falling asleep and they can prevent it from happening. Unfortunately thought, sleep just does not always work like this. If the hundreds of thousands of people who have died from falling asleep on the road could tell you, they would. To make sure that you are never responsible for a sleep-related accident or death, make sure you know the meaning of Drowsiness Is Red Alert. The stakes could not be any higher. It cannot be emphasized often enough that if you are driving or doing some other potentially dangerous activity and you feel sleep tugging your eyelids down, you absolutely must stop what you are doing. The life and death sleep crisis you are most likely to face will occur when you are driving. You are seconds away from tragedy and should hear a warning alarm blaring in your head (DROWSINESS IS RED ALERT!). Pull over immediately! No job, no vacation, no deadline, no goal, is worth putting your life, or the lives of others, in extreme jeopardy. How Has Sleep Deprivation Affected You? The effects of sleep deprivation are far-reaching, and the vast majority of us experience a host of them with all too frequent regularity in our lives, sometimes without even knowing it. How has your sleep debt affected you? Do you know of times where you weren't at your best due to lack of sleep? Share your story with the world below--your insight could aid others who can relate to what you have experienced. 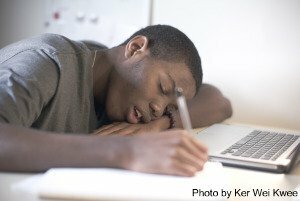 Click on the links below to read stories of others that have experienced the effects of sleep deprivation. They were all written by other visitors to this page, just like you. How Do You Make Up Sleep Debt From Fifteen Years? My sleep debt is easily 5000+ hours. One way to help yourself not become a victim of the effects of sleep deprivation is to make sure you're sleeping comfortably. Check out Mattress-Wiz.com for well-written and unbiased mattress reviews and rankings. Why should you care about the effects of sleep deprivation? The ultimate cost of sleep deprivation. Find out more about the effects of sleep deprivation from The Green Living Expert.